Rachel Lyndhurst: Something for the weekend - aural fun! Something for the weekend - aural fun! Sickening isn't it? And what about this? Does it fill your heart with dread, dears? Well, there is now hope. Following my summer holiday Sock Pile Epiphany, I have made another discovery that has made life a lot more pleasurable. Audio books are completely fab! Listening to Storm's Heart made all these horrid jobs a breeze - multitasking at it's very best. Armfuls of crisp, fragrant, ironed clothes and I barely realised I was doing it. Any time, Any place, Any where (remember that ad?). Why not try it for yourself? You can now listen to chapter one of Storm's Heart for free here at iambik ! Let me know what you think, lovelies! Did I forget to mention the book is totally unabridged as well? Best not do those silks during chapter six,eh? 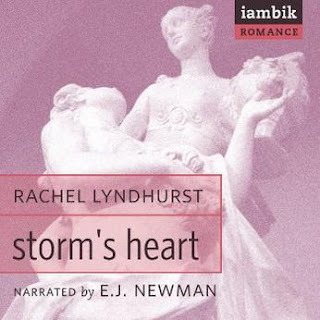 Storm's Heart the audio book goes live!